INTER was developed between the cities of Salvador (BR) and Köln (DE) by João Milet Meirelles and Lia Cunha on the occasion of her artist residency at Quartier Am Hafen | sep-nov 2017. Images and field recordings were collected by Lia Cunha and then processed by João Milet Meirelles to create the compositions. The music zine launch will happen at a performative intervention at une promenade, exhibition by Christiane Rasch at Bruch & Dallas gallery. Costume conceived as a sculptural intervention by Jessica Twitchell and Natalie Obert. Printed at ChaCha & Tantra by Andreas Trott. Published by Duna Editora. Residency exchange Programme Supported by: City of Cologne, Quartier am Hafen, Goethe Institut Salvador and Jari Ortwig. 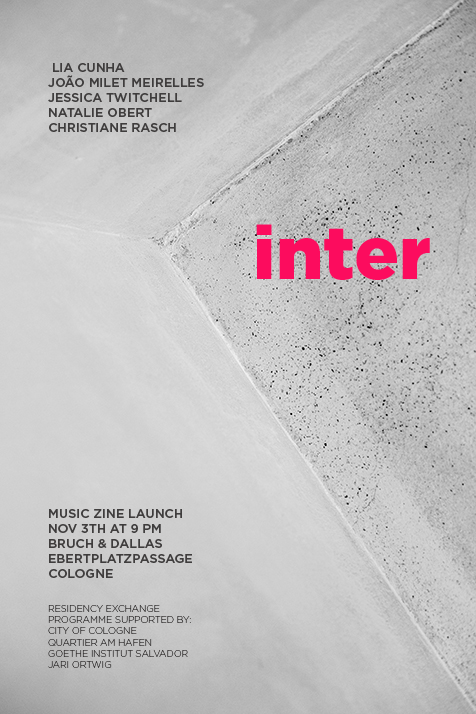 INTER book lauch was at Bruch & Dallas, 3 November 2017 at 9 pm, with João Milet Meirelles, Lia Cunha and Jessica Twitchell, including a performative intervention at une promenade by Christiane Rasch. This publication includes the sound recording of a site-specific performance by the ‘Voice and Space’ workshop participants, directed by Janneke van der Putten. Part of exhibition finissage ‘Directed to the Sun’ at Q18, Quartier am Hafen, Cologne (DE), 22 September 2017. With: Anne Weyler, Celine Bellut, Akiko Ahrendt, Marie Altgen, Michael Schuetz, Monika Heimann, Anna Dimpfl, Britta Tekotte, Andreas Bausch, Marianne Lindow, Rebeca Domiciano, Sophia Seiss, Lia Cunha, Samuel Duvoisin and Claudia Mann. Graduated in visual arts at Escola de Belas Artes da Universidade Federal da Bahia (EBA-UFBA). Lia Cunha (*1987 in Salvador Bahia, Brazil) develops collaborative projects on integrated arts, investigates the artist’s book in its interdisciplinary possibilities through the label „Duna“, atelier and artist’s publishing house specialized in object books, artists’s books, illustrated books, children’s books and musical publications. Composer, music producer, live electronics performer and photographer, João Milet Meirelles dedicates to sound and image research with special attention to textures and timbres and their relations with time. Coming from a family of theater artists and with extensive experience in the scene, his work photography, composition, production and musical direction meet and create their own aesthetic body. Work in partnership with DUNA editora – creative environment of the artist Lia Cunha – producing artistic books, zines and musical publications of Infusão (solo project), Beto Junior (free improvisation band). Since 2010 develop his work in music in live electronics performances with compositions within the “Infusão” (Infusion) project. The project is subject of study in the master course in the university (2016/2017) and in partnership with DUNA made a performance called “Concert for Onitonauts”, an performance for people sleep. It was conceived to the IC festival of performance arts in 2016. Also with DUNA released a single in a LoFi type of record, a kind of vinyl made with low cost meterials and craft. Since 2012 produces and do live electronics in the Baiana System. Band formed in 2009 with extensive curriculum and strong presence in the new Brazilian music scene. In 2011 formed the band Beto Júnior works with free and directed improvisation bringing with this band noise a noisy sound and good mood in the bassoon, guitar and computer. Along with Beto Junior and Duna idealized and coordinates the LARGO – platform for encounters in expanded music and other ways of producing speeches and sensations. Author of the photographic book Bença released in 2013. Artistic book in collaboration with DUNA, “Sobre os Pés de Quem Anda” (About the feet of thous who walk) in 2017. Since 2004 he has worked as a composer and musician of soundtracks for theater, dance and cinema. With recent award for best soundtrack for the short animation “Entroncamento” 2016 (Igor Souza – Lanterninha Productions) He participated in the Pulso 2016 residence in Redbull Station (São Paulo – Brazil) and the Drift residence in 2016 (Miguel Pereira – Brazil). Training: Graduated in composition by the music school of UFBA (public university) (2004-2009); Audio and Acoustics, IAV (2010); Professional Master degree in Music School of UFBA.